Picasso and Marc Chagall, two of the greatest painters of the last century, were friends until a dinner at Chagall's place in 1964. "When are you going back to Russia?" Picasso asked his host. They were both expatriots living in France. 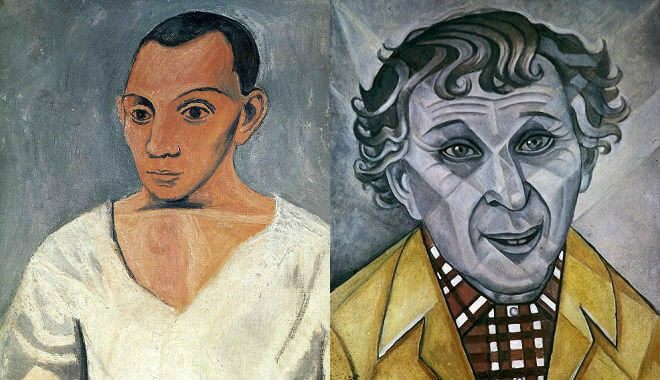 Chagall was Russian and Picasso was Spanish. "After you," said Chagall with a smile. "I hear you are greatly loved there [Picasso was a Communist] but not your work. You try to make it there and I'll wait and see how you do." Picasso didn't like that answer much. It was after dinner, he was feeling his wine, and his guard was down. "I guess with you it's a question of business," he told Chagall. "You won't go unless there's money in it." Francoise Gilot, who was at the table, says Chagall grinned at that remark but burned inside ever after. That was the end of the friendship. Both those Titans had severe commercial temptations in old age. Each suspected or believed the other was a sinner. But what did they think of each other's painting? When Henri Matisse dies, Chagall will be the only painter left who understands what color really is. I'm not crazy about his roosters and asses and flying violinists, and all the folklore, but his canvases are really painted, not just thrown together. Some of the last things he's done in Vence convince me that there's never been anybody since Renoir who has the feeling for light that Chagall has. What a genius, that Picasso. It's a pity he doesn't paint.